Also serving communities of Corbin, Manchester, Mc Kee. To help you with your search, browse the 3 reviews below for assisted living facilities in London. On average, consumers rate assisted living in London 4.7 out of 5 stars. Caring.com has helped thousands of families find high-quality senior care. To speak with one of our Family Advisors about assisted living options and costs in London, call (855) 863-8283. London lies in the heart of Kentucky, in Laurel County. With a wealth of parks to enjoy, such as Whitley Branch Veterans Park, and a moderate climate, the city has much to offer its seniors, including two assisted living facilities in the city and two more nearby. In London, the Kentucky Department for Aging and Independent Living is in authority over assisted living facilities. The department defines an assisted living community as a group of housing units, certified to administer services for five or more adults that are unrelated to the manager or owner. The climate in London is perfect for seniors who want to escape harsh winters. The city sees less than ten inches of snowfall annually. With a July high temperature of around 85 degrees Fahrenheit, seniors can spend more time outdoors, enjoying the beautiful scenery of the area. London has an affordable public transportation system for seniors needing non-emergency services. Rural Transit Enterprises Coordinated, Inc. (RTEC) is a non-profit transportation service, with routes in 18 southwest Kentucky counties. Seniors can make reservations for service to various locations, such as medical appointments or shopping trips. The cost of living rate is 17.8 points below that of the nation, and also falls under that of the state of Kentucky. Seniors will find that health care rates will also fall beneath those of the country and the state. Grocery rates are also below the U.S. average and are only slightly higher than Kentucky's average. The sales tax rate in London is 6.0 percent, the same as the national average. The income tax rate, at 6.8 percent, is only slightly higher than the country. Fortunately, the state of Kentucky exempts all Social Security income from taxation and offers considerable deductions for other types of retirement income. Seniors should feel safe in London. The city boasts a violent crime rate almost one-third that of the nation and over ten points lower than that of the state. Property crime, however, is considerably higher in London than in both the United States and Kentucky. The London area is home to world-class medical facilities, including KentuckyOne Health Saint Joseph-London, in the event of medical emergencies or illness. Assisted Living costs in London start around $0 per month on average, while the nationwide average cost of assisted living is $4,000 per month, according to the latest figures from Genworth’s Cost of Care Survey. It’s important to note that assisted living rates in London and the surrounding suburbs can vary widely based on factors such as location, the level of care needed, apartment size and the types of amenities offered at each community. In the state of Kentucky, as in many other states, Medicaid does not pay for assisted living services. However, the state does provide an optional state supplement to help cover assisted living costs. London and the surrounding area are home to numerous government agencies and non-profit organizations offering help for seniors searching for or currently residing in an assisted living community. These organizations can also provide assistance in a number of other eldercare services such as geriatric care management, elder law advice, estate planning, finding home care and health and wellness programs. To see a list of free assisted living resources in London, please visit our Assisted Living in Kentucky page. 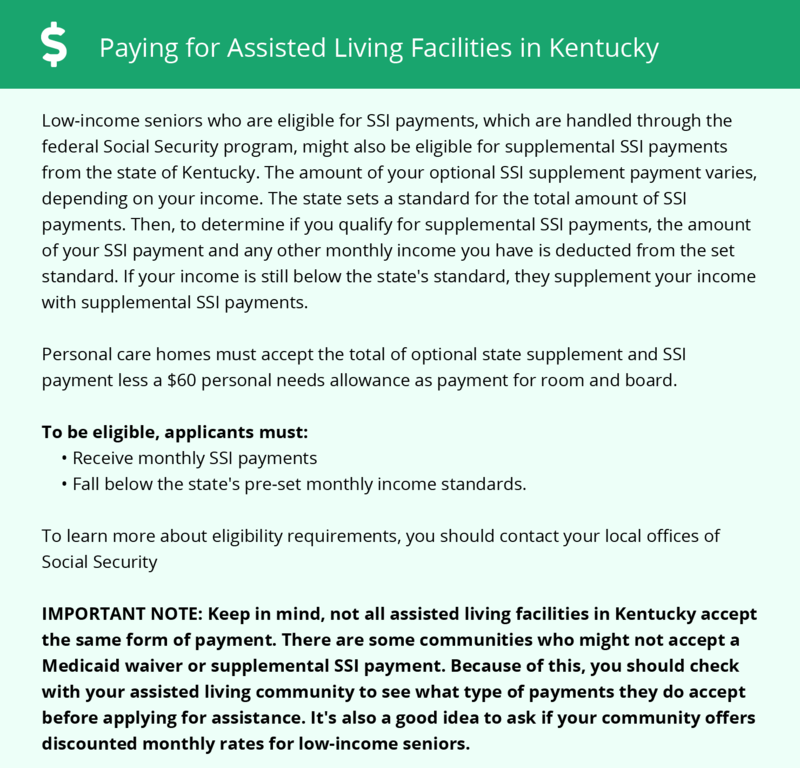 London-area assisted living communities must adhere to the comprehensive set of state laws and regulations that all assisted living communities in Kentucky are required to follow. Visit our Assisted Living in Kentucky page for more information about these laws.